“We needed to know more about what behaviour was going on around the school and that’s why Sleuth was brought in. It has allowed us to analyse behaviour, initially from a leadership perspective and then across the whole staff team. “For launch we focused on negative behaviours. The information we now have in Sleuth highlights which areas need support, so which departments, staff, pupils. We are using Sleuth as a support mechanism, it’s a routine item on our leadership agenda every week; “Right, okay. So we’ve noticed that something’s going on here. Let’s do something about it.” Using the capacity within the senior leadership team we can intervene and support appropriately. “Previously, we’d used our MIS but we couldn’t access this kind of information as fast and that was a problem. Sleuth is more efficient and has the quickness of the data entry and of reporting. “Obviously it needs to be set up correctly and with the support that we’ve had from your team our key-users have set it all up so that staff can just click once and get the report that they need. That was essential for us, keeping it easy and simple is something that we needed to do. “Ofsted have been in and we were able to show them what we were doing. We’re not just tracking behaviour, we’re also using Sleuth for recording punctuality. So, when a pupil comes after 8:45, they have to come through reception. Reception then put it onto Sleuth so can then quickly monitor the amount of lates we get into school every day and every week and use that information to plan how we’re going to tackle that. Sleuth allows us to be creative with what we want to record and track. “The launch was achieved in less than a month from planning the setup to going live whole school with all staff using Sleuth. The training was done in a carousel format in the summer term after Year 11s had gone and we’d got some time. We did a carousel on a CPD day and then we had small cohorts for training rather than a big presentation, more of a workshop where they got to play around with it and enter examples. “Mr. Ward is now ready to take over the reins and lead the project from here. So, now we are dealing well with negatives we need to look at developing positives and recognition. 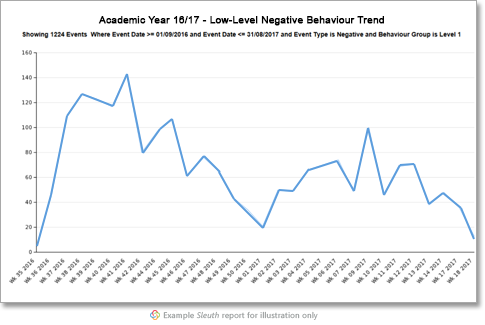 We’ve already had a non-uniform day where the criteria was a period of no red cards for behaviour and all of a sudden, you see a dip in negative behaviour.